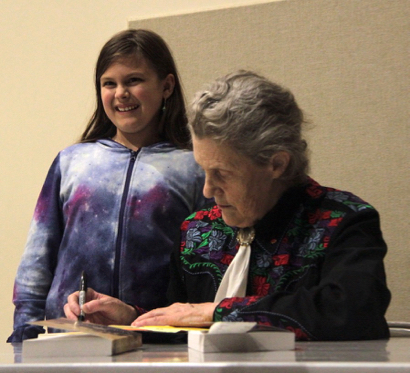 In an appearance sponsored by Kepler’s Literary Foundation, Dr. Temple Grandin was in Menlo Park last week talking about her latest book, Calling All Minds, and her life in general, taking questions from a sold-out audience that included elementary and middle school children at the Hillview Performing Arts Center. 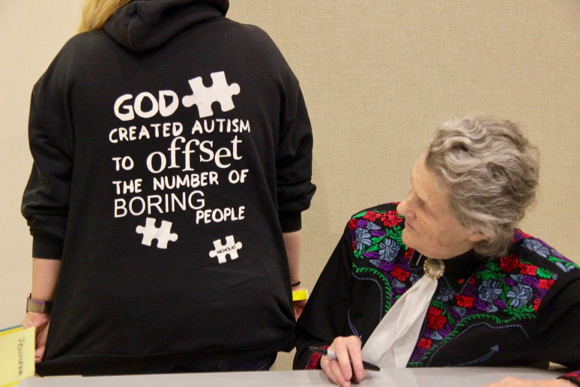 The author of numerous books, Temple is a professor of animal science at Colorado State University, a consultant to the livestock industry, and autism spokesperson. Written for children ages 8 to 12 (grade 3 to to 7), Calling All Minds explores the ideas behind questions like how to make a kite fly, why golf balls have dimples, or how to make a kaleidoscope. Temple delves into the science behind inventions, the steps people took to create and improve upon ideas as they evolved, and the ways in which young inventors can continue to think about and understand what it means to tinker, to fiddle, and to innovate. The book is available at Kepler’s (1010 El Camino) and Kepler’s online.